Sure, the iPhone 7 can withstand a little splashing, but a new Kickstarter campaign is aiming to take the smartphone over 300 feet underwater — without losing the touchscreen controls. LenzO is an iPhone 7 and 7 Plus case designed to turn the phone into a diving camera. After launching on Kickstarter last week, the LenzO is already over a quarter of the way to a $60,000 funding goal. Created by the designer for National Geographic’s first underwater housing, Valentins Ranetkins, and five-time Emmy Award-winning underwater cinematagrapher Anthony Lenzo, the case seals out water down to 100 meters or 328 feet. 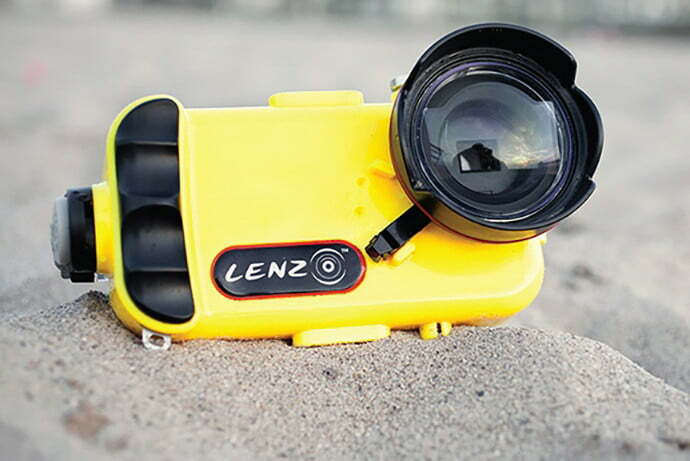 But besides waterproofing the case, the Lenzo by ValsTech also solves another challenge — using a touchscreen underwater. The case uses two control systems, through which operating a control on the outside of the case adjusts a small arm on the inside of the case. With a press on the outside, the arm will touch the screen on the inside, controlling camera functions within that water seal. Access to the physical home and wake/sleep buttons is also maintained with the case. Along with access to the camera controls, the case also includes built-in filters to adjust the camera’s white balance to shoot underwater. A dome gives both the rear and front-facing cameras an unobstructed view, the company says. While the iPhone 7 case will float to the top if you drop it, the iPhone 7 Plus case is instead made from solid aluminum. ValsTech says the aluminum version will have a better depth rating, but didn’t say just how far beyond that 328 feet the case can dive. LenzO’s creators say the case is the only iPhone 7 underwater case that works with the native camera app instead of a third-party download. If the Kickstarter campaign is successful, early backers can receive the Lenzo for $229 for the iPhone 7 or $450 for the iPhone 7 Plus, while the cases are expected to retail for $395 and $749. The company’s iPhone 6 and 6S housing retails for $295.